Everyone’s entitled to their opinion. Beauty is in the eye of the beholder. À chacun son goût. However much I say things like that, though, you’re probably never going to forgive me if I tell you—if I lean in close and divulge, in a confessional whisper—that really I quite liked brushed metal. For most Mac users, this is the equivalent of announcing you liked Jar Jar Binks, who as it happens had first appeared on slightly bigger screens less than a month before brushed metal made its debut on the Mac. Somewhere early in the new millennium, it appears, the Mac community gathered in a hall somewhere—there were many fewer of us in those days—and decreed that brushed metal was bad and everyone who liked it should feel bad. A quick history lesson: in the summer of 1999, Apple’s hardware was mostly swooping organic shapes and bright plastics, but while Macs might have looked nothing like the beige, dumpy boxes that Apple had introduced with the Macintosh in 1984, the Mac operating system looked basically the same. Sure, we’d gotten color and the odd bevel here and there, but broadly the operating system looked identical in 1999 to how it had 15 years earlier. 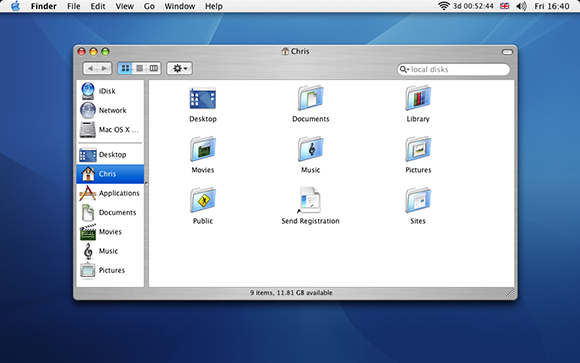 On June 8, however, Apple released version 4 of QuickTime, and while this was otherwise a relatively minor footnote in the story of Apple, one thing about QuickTime 4.0 was notable: it was the first time a major new change came to the visual language of the operating system, with the introduction of a brushed metal effect in its window. And I remember thinking it looked awesome. Solid gray (okay, “Platinum”) panels, thick black outlines, a 1-pixel trompe-l’œil drop-shadow. Sharp corners. Antialiasing only on the text—and even then not all of it. And then we got this. Actually, this too is from Mac OS 9, and it’s a slightly later version of QuickTime, but the basics are all the same. Now, there was a texture in the window—that scaled and resized!—which after years of staring at simple, plain white or gray boxes was new and spectacular. It’s not just a different color or a thicker bezel, it was something qualitatively different. And rounded corners! And (in this version at least) hints of Aqua! Look, I know it looks a bit lame, especially to post-iOS 7 eyes, and I understand why we all started to hate it, either on aesthetic grounds (man, did it start to look heavy) or ideologically in response to even Apple developed a cavalier disdain for its own Human Interface Guidelines. But before the internet told me and everyone else what to think about things, I thought it looked cool and exciting. 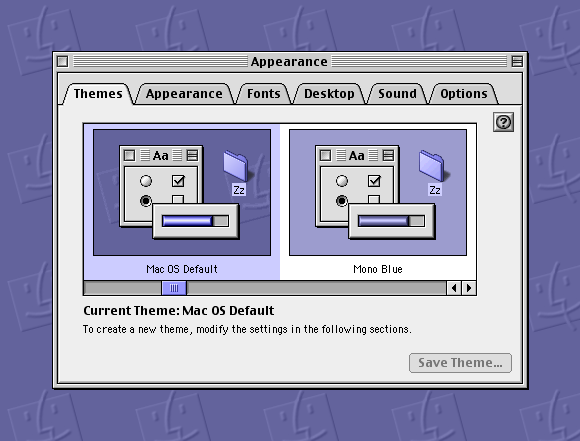 And yeah, here in a pre-OS X interface it looked particularly out of place. While OS X, with its pinstripes and glossy buttons and translucency, would bring a riot of textures to the Mac’s operating system, versions of the OS that predated it were mostly flat. Today, the thing that looks most egregious about the QuickTime window above is the fact that it doesn’t have a drop-shadow to help delineate it or show it’s active. It wasn’t until Mac OS X 10.3 that brushed metal made its audacious leap for the mainstream. You couldn’t escape it even if you wanted to; the Finder windows were decked out with brushed metal. 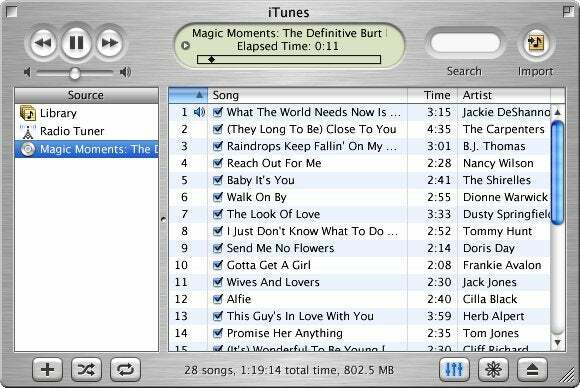 It’s ironic—at least in the Alanis Morissette sense, since we’re in the ’90s—that the clunky chunkiness which seemed to be part and parcel of the brushed metal interface was so ill-suited to the small screens we were all working on back then—just look at the wasted space in the iTunes screenshot at the very top, at how little space it dedicated to content—and that today the computers most of us are using actually do have quasi-brushed metal exteriors. In other words, in an alternate universe, brushed metal makes much more sense today than it did last century. Brushed metal, though, was gradually but inexorably to be phased out, even before skeuomorphism became a dirty word around Infinite Loop. But I liked it. It struck me as novel and impressive, and a little bit fun. There again, I thought much the same about the old Podcasts app, the poster child for anti-skeuomorphic zealots, and I liked it too. Meesa not even sorry.